Last night I got in an argument with myself in the middle of the appliance aisle at Target. Luckily this time I kept most of it inside my head, except for the portion I spoke aloud on the phone with my mother, who lovingly coaxed me through the decision-making process (and my teetering sanity). 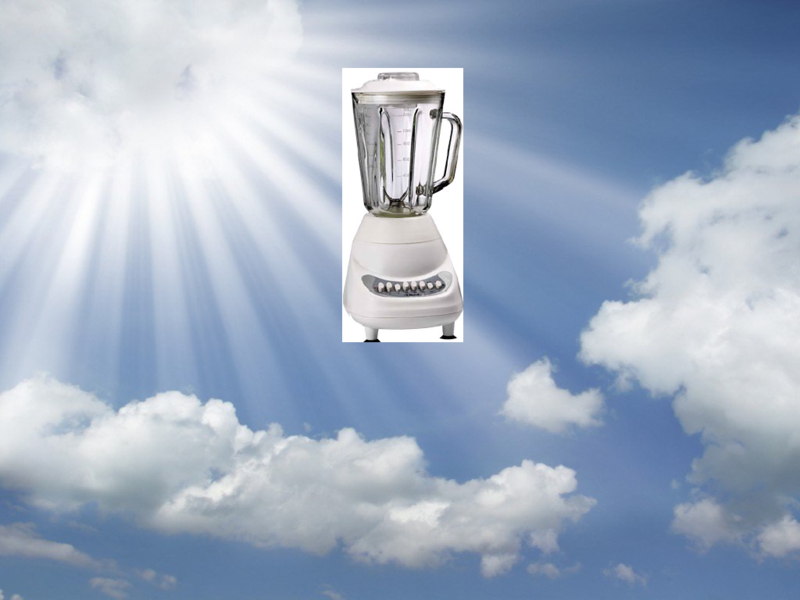 My predicament took the form of a brand-spankin’ new blender, priced at a respectable twenty dollars and positioned exactly at my eye level, where I could easily examine its beauty. It had a stark white top, a clear plastic pouring/blending doodad, and no less than ten buttons holding the promise of possibilities. But before I could put it in my cart, I heard Dave’s voice tell me no. You see, Dave has 2 reasons to oppose my blender acquisition and has stated them loud and clear many a time. The first is that he has the “Made for TV” Magic Bullet, which can pretty much do anything a regular ol’ blender can do, but it looks cooler and takes less counter space. It does, however, take up a great deal of cabinet space with its multitude of little color coded cups and contraptions. In addition, it’s old and rusted and the last time I tried to use it my kitchen was overcome with smoke. I usually stop using things when they start smoking. It was a long, hard lesson. The second reason (and my most hated) is that Dave has a food processor from the 60’s that has been handed down by I-don’t-know-who in his family. It’s olive green and has more attachments than I know what to do with. When he showed it to me in his excitement, I promptly pointed out how much space it would take up on my counter and in my cabinet. I then took the food processor and all of its million, complicated parts, put them in a tote, and hid it all on the top shelf of the closet. You may think it’s hard to hide a tote, but I’ve moved 14 times in 24 years and Dave’s moved 12- we have a lot of them. On top of it all, the food processor doesn’t have an instruction manual because it’s lost somewhere in the 1980’s – twenty years after it was invented. Dave gets upset that I don’t make use of it and highlights its many wonderful features, including the ability to turn mere potatoes into fully fledged french fries. It can make whips, dips, creams and salsas. It can do things to a tomato that I can only dream of. Actually, I can only dream about all of those things because without an instruction manual, I’m never really going to know how to work all those cranks, levers, and wheels. Question…. Who does the majority of the cooking in your household? If it’s you…. well then it’s not a waste or a blender of shame because it’s for you to make your life easier. If he does the majority of cooking.. hide the new toy in on of those many totes you have..
Have you tried to search online for a copy of the manual lost in the mists of time? It’s surprising how many manuals for all sorts of appliances are on there.